They're back -- the incomphrehensible duo Chan and Tucker once gain race across our screens in a flurry of kicks, punches, insults and ear-boggling line delivery. In this smack-happy slapstick, Chan as Hong Kong Chief Inspector Li) uses his acrobatic martial arts to escape life-threatening situations of his, and his high-pitched motor-mouthed LAPD partner's making. Set in Hong Kong and Las Vegas (two very garish, but different locations), the story follows a full-speed funny-money chase. 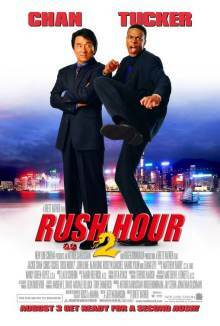 Slick, fast, and unashamedly commercial, Rush Hour 2 is funny and just plain fun.